I graduated from Caledonia High School. With only a high school education, I have had a full life. In 1972, my family moved to Florida where I lived for 10 years. While in Florida I worked for Gulf Oil Company at the pier as office manager. As my parents lived in Arizona and were not getting any younger, I felt the move to Arizona was needed. I arrived in Phoenix on June 2nd of 1982. I went to Real Estate school and began selling Real Estate in March of 1983, and there is where I met my wonderful husband Jim………And we were married June 2nd of 1984. Real Estate really was not the kind of career I wanted, so I went to work for The Fire District of Sun City West as Office Manager in March 1992. When I retired after 10 years, I began to dabble in the world of crafting. Now, that is when I feel I found my Niche. Internationally known Company “Stampin’ Up!”. What a difference. 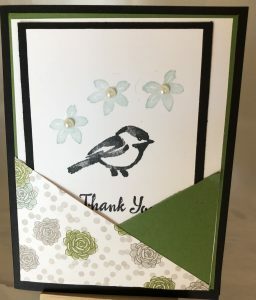 I love being able to show and teach others how to create beautiful cards, 3D paper projects, and stamping techniques using the wonderful supplies and tools that Stampin’Up! has to offer. 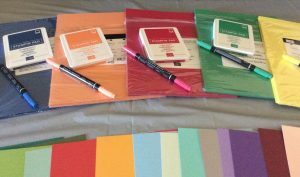 The coordination of their card stock, DSP, ribbon, inks, and embellishments makes it very easy to become addicted to making beautiful projects. It is truly amazing how happy I am, being able to earn money while staying home and having fun doing what I like doing best.